“It is the biggest religion to protect the dignity of woman, even if she belongs to our enemy”, a dialogue from play ‘Asmita’ expressed the divine character of great warrior, which revived the glorious saga of history where MaharanaPatap ruled the kingdom of Mewar from 1572 to 1597.On the occasion of 478th birth anniversary of MaharanaPratap on June 16, the Maharana of Mewar Charitable Foundation organized various activities in ZenanaMahal at The City Palace. 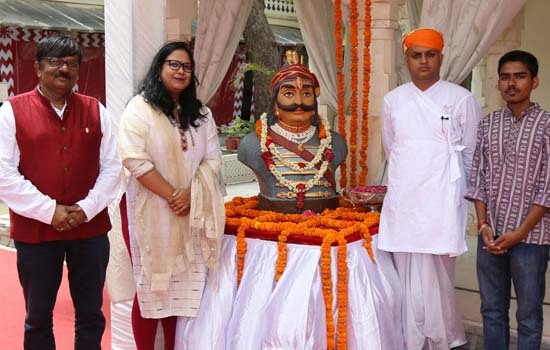 Solo play ‘Asmita’ exhibited Pratap’s ideology and respect for women to tourists visiting City Palace, students of VidhyaBhawan Society and Army personnel. The function started with showering the flowers on the statue of MaharanaPratap followed by the inspirational play based on significant incident of his life. Enacted by Manish Sharma, produced by Martand Foundation, Udaipur and written by Dr. Chandra Shekhar Sharma, the story was focused on an event where Abdul Rahim Khan Khana, a Muslim Warrior leader of Akbar changing in to Sufi. The play was conceived and directed by Vilas Janve. The play deeply affected the audience. Battle of Haldighati was not the battle of religion because many Rajput leaders fought from Mughal Emperor Akbar’s side while Pratap’s army was commanded by Hakim Khan Sur, and few Rajput Commanders besides Bhil soldiers. MaharanaPratap fought to maintain the freedom and dignity of Mewar. After this battle, Akbar orders Abdul Raheem Khan Khana, the Subedaar of Ajmer to capture Pratap. Khan Khana proceeds to Mewar with all arrangements; he even takes ladies on this mission. After camping at Shergarh he along with his army goes in search of Pratap. But his camp was attacked by Amar Singh, son of MaharanaPratap, who takes all his valuable jewelry, soldiers and also KhanKhana’s Begum (wife) and brings in the camp of Pratap.